Abstract: After the Christmas, the annual New Year Day is around the corner. You must have experienced the black Friday. Faced with millions of products, have you decided which one as your New Year present? If not, Airwheel H3S power chair will be recommended, as it will be an impressive New Year present for the old in the families. The New Year is around the corner and 2018 is coming. Faced with millions of products, have you decided which one as your New Year present? Presenting gifts shows your blessings to your friends and family members. However, if the gift is to his or her heart, you just give an added grace to what is already perfect. Airwheel H3S smart electric wheelchair will achieve such effect, as it is intensely brilliant both inward and outward. Airwheel H3S power and manual wheelchair is a combination of tradition and modern, featuring two ride modes—electric mode and manual mode. In the manual mode, riders can enjoy the company of friends and families. The electric mode gives riders an effortless ride and allows riders to stop and chat freely. It is super easy to ride with the intelligent joystick controller. Small and comfortable, it accords with ergonomics. To go forward, backward and turn directions, riders just push the controller to the corresponding directions. When the hand does not touch the controller, it will automatically brake. Another highlight is the automatic folding function, which makes H3S folding electric wheelchair different from others. When arriving the destination, riders just press the "fold" button in the controller to fold it automatically and the manageable size allows riders to store it easily and conveniently. 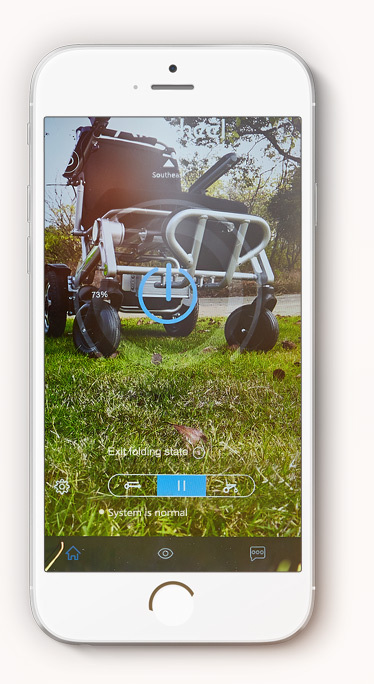 Additionally, Airwheel H3S can be connected to the mobile phones as long as there is an exclusive App on the phones. In addition to learning the riding data, its app lets riders control it remotely. It will come to you by remote control and three remote controls are available. More user-friendly designs can be found http://www.airwheel.net/home/product/h3s. To conclude, it is more than a means of transport, it is also an advanced gadget full of intelligent and fashionable elements. Overall, Airwheel H3S motorized wheelchair will be definitely an impressive present.